Tuesday, February 28, 6 p.m.
Thursday, March 23, 7 p.m.
Moderator of program with Israel Consul General Andy David and India Ambassador Venkatesan Ashok, "Israel and India: 25 Years of Diplomatic Relations." Moderator of program with Middle East scholars Banafsheh Keynoush and Maher Kalaji on "The Qatar Crisis." Monday, October 16, 6 p.m.
Moderator of program with journalists Robert Rosenthal and Janine Zacharia on "Deteriorating Freedom of the Press in the Middle East." Moderator of program with Iranian-American scholar Banafsheh Keynoush, about her new book, Saudi Arabia and Iran: Friends or Foes. Monday, August 15, 2016, 6:30 p.m.
On-stage interview with Giles Duley, photojournalist and activist about his work with Syrian refugees, for a Commonwealth Club program called "The Invisible People: Syrian Refugees." Guest lecture to associate professor Teresa Moore's media internship class, on writing about the intersection of social issues and popular culture, and reporting on diverse communities. Moderator/interview with Simon Schama, Columbia University professor of history and art history, about his new book and TV documentary series, "The Story of the Jews." Thursday, July 24, 6 p.m.
Moderator of the panel discussion, "Town Hall: Gaza in Crisis," with law professor George Bisharat, clinical professor of psychiatry Jess Ghannam, radio host John Rothmann, and journalist Janine Zacharia. 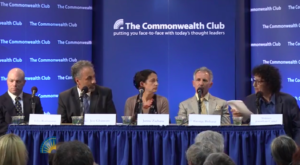 Moderating the panel discussion "Town Hall: Gaza in Crisis"
On-stage interview with Middle East scholar Banafsheh Keynoush, for a Commonwealth Club program called "Middle East Hotspots: Geopolitics and Stability." Sunday, May 19, 1-2 p.m.
Moderator at artMRKT San Francisco, for the panel discussion, "The Legacy of Gordon Parks." The discussion featured Karen Jenkins-Johnson, the owner of Jenkins Johnson Gallery, which exhibited Parks' work; Julian Cox, Founding Curator of Photography and Chief Curator, Fine Arts Museums of San Francisco; and George Philip LeBourdais, photo historian and Stanford Ph.D. Candidate in Art History. Friday, June 14, 8:45-9:15 p.m.
Moderator at a post-screening panel discussion of "Dirty Wars." The panel featured the documentary's producers, Anthony Arnove and Brenda Coughlin, and David Harrington of the Kronos Quartet, who scored the film. The documentary is about Jeremy Scahill's search for the truth behind the U.S. government's covert war efforts in Afghanistan, Yemen and other countries. Tuesday, August 13, 6:30 p.m.
Moderator of panel discussion, "Egypt and the Middle East: What's Next?" Panelists were Michael Nacht, Professor at UC Berkeley's Goldman School of Public Policy and the Obama Administration's former Assistant Secretary of Defense for Global Strategic Affairs; Jamal Dajani, Vice President of Middle East, North Africa, Latin America, and the Caribbean, Internews Network; Dina Ibrahim, Associate Professor of Broadcast and Electronic Communication Arts, San Francisco State University. Monday, Sept. 30, 6 p.m.
"Hope and Fear: Egypt on the Tipping Point" On-stage interview with Egypt expert and San Francisco State University professor Dina Ibrahim, and a preview of a new documentary that she produced, "Hope and Fear: Egypt on the Tipping Point"
Sunday, Dec. 22, 10 a.m.
Monday, July 23, 7:30 p.m.
On-stage interview with Haines Gallery director Cheryl Haines, after a Commonwealth Club-sponsored screening of the documentary "Ai Weiwei: Never Sorry." Haines knows Weiwei and has exhibited his work. Wednesday, October 10, 6-7 p.m.
Skype interview with photographer Mary Ellen Mark, part of the 10-day “Art Gallery Week,” where San Francisco galleries do special events and exhibitions for art-goers. Interviewed twice by the BBC about the death of Indian sitarist Ravi Shankar. Both shows were live broadcasts. The first interview was with BBC Newsday, the BBC's overnight radio show that's heard on radio stations around the world. The second interview was with BBC Today, the BBC's flagship morning program that’s heard across Britain every morning. Thursday, December 27, 6-7 p.m. Interviewed by the blogtalkradio.com show "Open Forum," hosted by Amadou Shakur. The show, a live call-in segment, covered different chapters from the book, Al' America: Travels Through America's Arab and Islamic Roots. Sunday, December 30, 10:15-11 a.m. Interviewed by Harlem Community Radio, 90.3 FM in New York, for a live call-in segment about the connection between Muslim slavery and the roots of U.S. blues music. Host of "Talk Cinema" screening of the Dutch film "Bride Flight"
Saturday, February 19, 7:30 p.m.
Panelist at "Islamic West Africa"s Legacy of Literacy and Music to America and the World," a national conference hosted by Tougaloo College and the International Museum of Muslim Cultures, sponsored by the National Endowment for the Humanities. Panel is titled "Muslim Roots of the Mississippi Blues." Friday, February 25, 7:30 p.m.
Friday, March 4, 7 p.m.
Keynote speaker at Global Humanities Symposium. Talk is titled, "Dispatches From The Third Way: Arab and Muslim Culture in America." Tuesday, March 29, 3 p.m.
Wednesday, May 11, 6:30 p.m.
On-stage interview with Richard North Patterson about his latest novel, "The Devil's Light," which imagines what happens when al-Qaeda obtains a nuclear weapon. The interview was done for the Commonwealth Club. Monday, July 18, 6 p.m.
Moderator of panel discussion on the Arab Spring demonstrations that have roiled the Arab world for months. Panelists are Nour Ahmadein, Janet Penley, Maher Kalaji and Abbas Milani. Thursday, July 23, 4:30 p.m.
Interview with Radio Islam, based in Chicago, about the influence of Islam on American culture. The interview with host M. Salahuddin Khan is broadcast live on WCEV-1040 AM in Chicago. Sunday, August 21, 6 p.m. Guest speaker at Islamic Society's interfaith dinner. Appearance to discuss Granta 116: "Ten Years Later" - the latest issue of Granta magazine, which covers the 10th anniversary of the 9/11 attacks. Also appearing are authors Elmaz Abinader, Adam Johnson and moderator Kieran Ridge. Sunday, December 4, 10 a.m.
Tuesday, January 26, 11 a.m.
"Al' America" talk - part of the lab's "Authors Series"
Wednesday, February 3, 7:30 p.m.
Saturday, February 27, 10 a.m. Host of "Talk Cinema" screening "Harry Brown"
Wednesday, March 24, 11:15 a.m.
Saturday, April 24, 6 p.m.
Friday, May 14, 9 a.m.
Sunday, June 27, 2 p.m.
Tuesday, August 3, 11 a.m.
"Al' America" talk, part of the Global Summer Program course "Media, Culture and Society: The Middle East in the Global Context." Tuesday, September 28, 7:30 p.m.
Tuesday, January 6, 10 a.m.
Wednesday, January 7, 5 p.m.
Sunday, January 11, 3:30 p.m.
Wednesday, January 14, 10 a.m.
Tuesday, January 20, 6:30 p.m.
Sunday, February 1, 10:15 a.m.
Tuesday, February 10, 1:30 p.m.
Thursday, February 12, 3 p.m.
Saturday, February 21, 10 a.m.
Monday, February 23, 6 p.m.
* Monday, March 2, 2 p.m.
Panel discussion on "Covering Islam"
Tuesday, March 24, 6:30 p.m.
Wednesday, April 1, 6:30 p.m.
Sunday, May 3, 6 p.m.
Monday, May 4, 8:30 p.m.
Wednesday, May 27, 7:30 p.m.
Friday, May 29, 7:30 p.m.
Tuesday, September 1, 6 p.m.
Thursday, September 10, 5 p.m.
Friday, October 2, 8 p.m.
Friday, October 9, 7:30 p.m.
Honored by the Arab Cultural and Community for â€œcontributions to enhancing the Arab narrative." Others receiving awards included Dave Eggers, Jamal Dajani, and George Bisharat. Monday, October 12, 7 p.m.
Saturday, October 17, 10 a.m. Host of "Talk Cinema" screening of "The Men Who Stare at Goats"
Thurday, November 5, 7 p.m.
Thursday, December 3, 6 p.m.
Saturday, May 17, 11 a.m.
Monday, November 10, 6 p.m.
Monday, November 10, 11 a.m.
Wednesday, November 12, 7 p.m.
Thursday, November 13, 7 p.m.
Monday, November 17, 1 p.m..
Monday, November 17, 7:30 p.m.
Wednesday, November 19, 12:30 p.m.
Wednesday, November 19, 7:15 a.m..
Thursday, November 20, 7 p.m.
Sunday, December 7, 2 p.m.
Monday, December 8, 6 p.m.
Wednesday, December 10, 1 p.m.
Tuesday, December 23, 3 p.m.
Sunday, December 28, 4 p.m.